Sure, everyone is familiar with the Fuller Building, the triangular skyscraper located in Manhattan and featured in countless movies and TV shows. But what about Columbia’s own flat-ironed shaped icon? I’m talking of course about Yesterday’s Restaurant and Tavern, located between Santee and Devine Streets in the heart of 5 points. I had some other errands to run (READ: last minute gift buying for Mrs. Rabbit), so I arrived at the restaurant a little early but was quickly seated in a booth that looks like it was made up of one of the church pews from the Crucible. Looking around, I noticed that pretty much all of the decor was at least as old as the faded photographs of past patrons and revelers posted throughout the place. Don’t get the wrong idea – the place is charming, but it is certainly not “up to date.” This is not meant as a slight – in fact I would wager that the Publican finds the furnishings to be one of the most admirable traits of Yesterday’s, aside from the collards (more on that below). I had the waitress bring around three waters for the table (standard Lunchmen protocol – never order a tea/soft drink unless it comes with the meal free of charge. 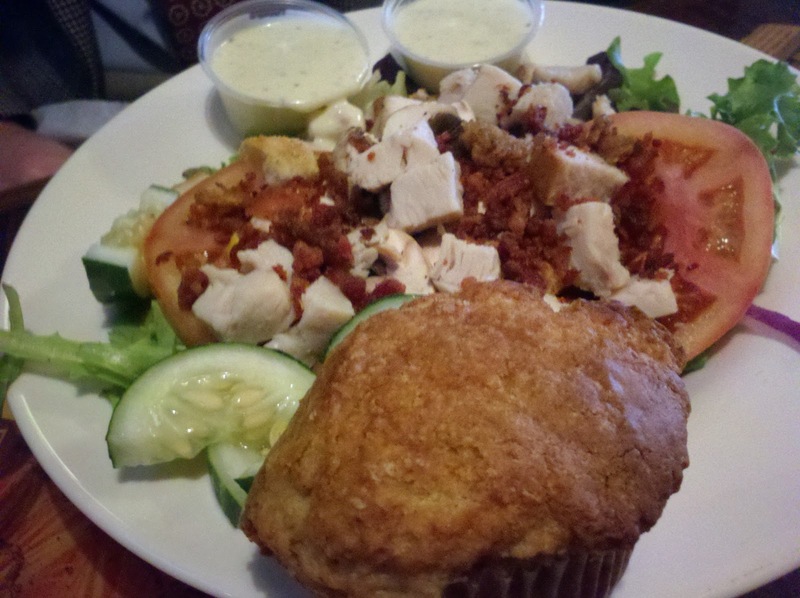 Do that everyday day at lunch, and you save 8-10 bucks in a week – an extra lunch basically on the house! It’s like your own personal punch card!). She offered to let me look over the menu until my now late companions arrived, but I assured her there was no need to wait, stating: “The Publican will have the Salmon and Grits with Collards, Tank would like Chicken and Grits with Squash Casserole, and I’ll have the Chef Salad, of course.” At first she stared at me, probably wondering who “Tank” and “The Publican” were, and whether or not she should go outside and fetch one of those 5-Points cops on horseback to take me away to the funny farm. But, seeing I was by no means joking, she wrote the order down and sent it back to the kitchen. Obviously our waitress has yet to discover the blog. Hopefully that will not be the case for long. Luckily, my partners in crime soon arrived, providing me with some vindication in the waitress’ eyes, and the food was not far behind. Everything came out looking fresh, and we were all impressed by the quantity and presentation. The Publican’s salmon and grits were perfect – the thing I love about good salmon filets is when they are so tender that you could take a plastic spoon and slice them it up like Lorena Bobbit with a Ginzu. 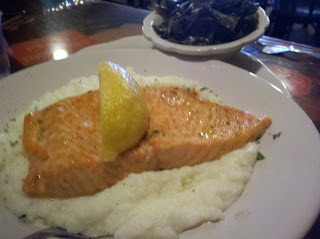 This plate was no different, the salmon looked like it was melting into the grits. The collards are probably the best thing on Yesterday’s menu, and after the Publican dressed his properly (READ: literally drowned them in pepper vinegar) I was able to try a bite, much to my delight. Tank was giddy on two levels. 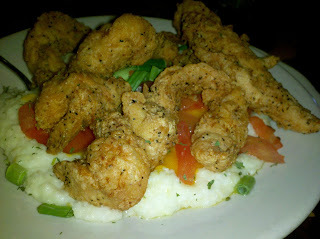 First, with the sheer mass of juicy chicken breast tenders that floated atop his bowl of grits. Second, with the cheese and chives that compliments the dish, creating an interesting, if not overwhelming flavor scenario. Intrigued by the squash casserole, which I admittedly ordered for Tank without his authority and more out of my own curiosity, we all tried some. It was, in a word, different. Not saying bad, but definitely unexpected. I’d be interested to see the recipe, that’s for sure. Finally, my chef salad was just as you want it – big, with the meat finely chopped but the vegetable sliced whole, and heavy on the toppings. Of particular note is Yesterday’s bread offering. Rather than a plain roll or a couple of crackers, Yesterday’s hits salad lovers with a freshly made muffin to go with their meal. An unexpected but welcome surprise, and one that actually complimented the meal perfectly. The muffin was not large, but it was loaded with banana flavored goodness, and could have quickly eaten a half dozen if allowed to. We all shuffled out of the booth pleased, both with amount of food and its quality. The story does not end here, however. Yesterday’s has so much going on that I feel duty bound to mention the following items. First, the bar area is large, eclectic, and usually fairly crowded. Happy hour is a good place for a cold draft beer at cheap prices and can lead to conversations with a professor, a construction worker, and maybe even a stock broker or doctor. Also, the bar food is second to none – I’d put the cheese fries here (served with extra little cups of bacon bits to add in at your leisure) up against any in town. Perhaps most important though, is the comfort food. In addition to the grits plates, they also are famous for their fried chicken, Confederate Fried Steak, and the signature “Arkansas Traveler” (Roast Beef served over cornbread with black eyed peas and gravy – about as healthy as Arkansas Razorbacks fans are classy). All of these are undoubtedly delicious, but also undoubtedly lethal to a productive afternoon at the office. Consume at your own risk. Really, there is something for everyone here, making it a great spot for a large group with lots of different tastes. If you are ever in the 5 points area and have the time, this is a must stop.